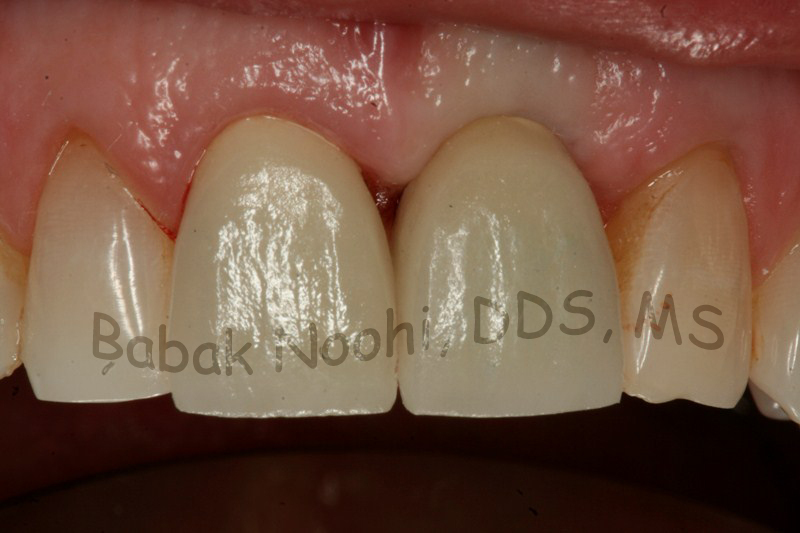 This female patient came with a request to have her crown re-cemented. She had previously received two root canal treatments on the same tooth, and for the third attempt to save the tooth she had an apicoectomy. 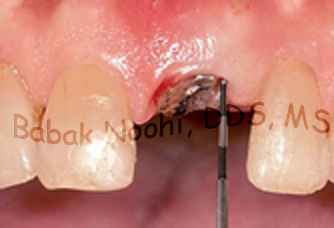 Finally, her tooth fractured and the crack was extending into the root and the tooth was no longer restorable. Replacing the fractured tooth with a dental implant (BioHorizons in this case) was offered. Patent asked me if i could put some glue inside the tooth and glue the broken segments together and the answer was “No”. There are three important things to consider before placing a dental implant. “Planning, Planning, Planning”. In cases like this, “esthetics” is the key to define success. In depth knowledge regarding the bone biology and healing is the key to successfully treat this case. I sequenced the case in three phases, and assured the patient that we would methodically walk through the treatment without rushing to ensure optimal results. Patient education and bringing them on board is also an important factor for a successful treatment. In my opinion providing dental care is not a “race” to rush through. Knowing when to take slower steps and when to accelerate is what differentiates between “excellent” and “average” outcomes. Fractured tooth, after multiple attempt to save it with root canal treatments finally splits in half. extraction and grafting the extraction socket. 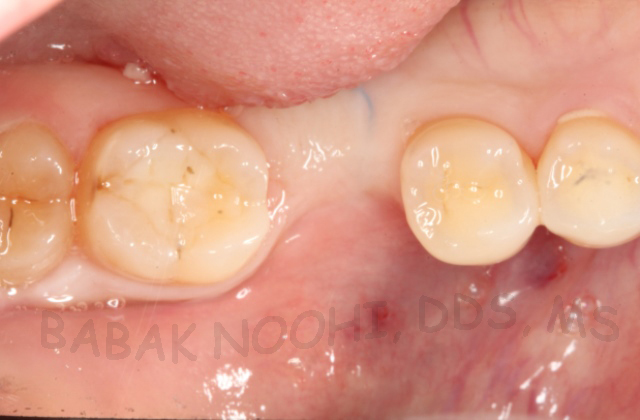 This case demonstrates the missing of the first molar on the lower right side due to failure in root canal treatment. 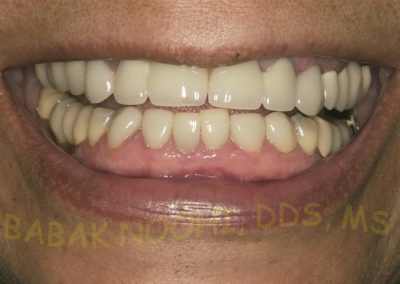 A root form dental implant was secured in the jaw bone and after three months it was restored with a Customized Implant Crown. 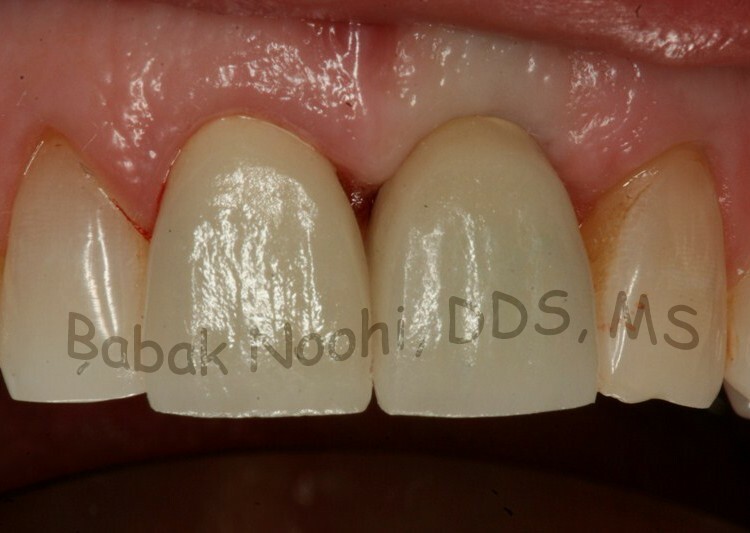 This case presents restoration of a fractured tooth with a dental implant in the aesthetic zone. 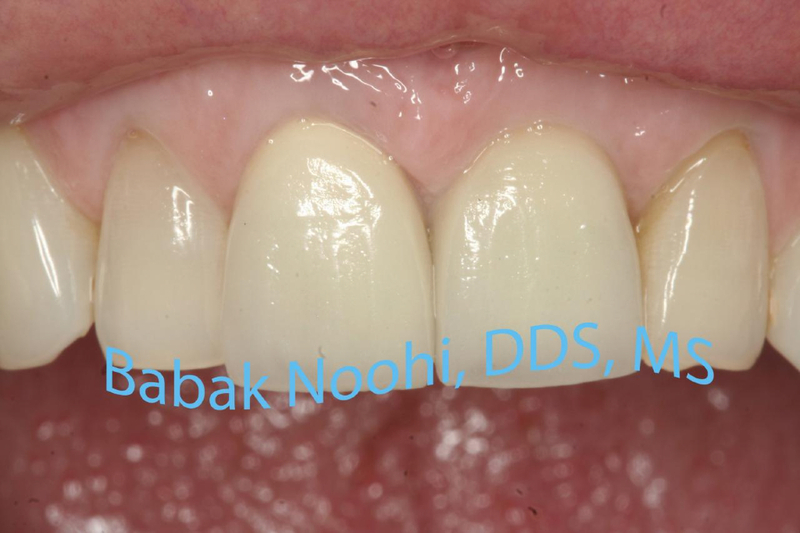 Implant was placed immediately after extraction and restored with a temporary crown, and finally was restored with a custom made abutment and a final crown. 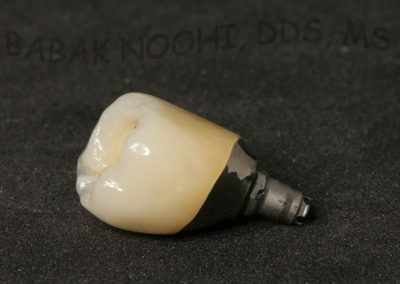 The importance of using a “custom” made abutment is to achieve superior esthetics and more ideal support for the crown. 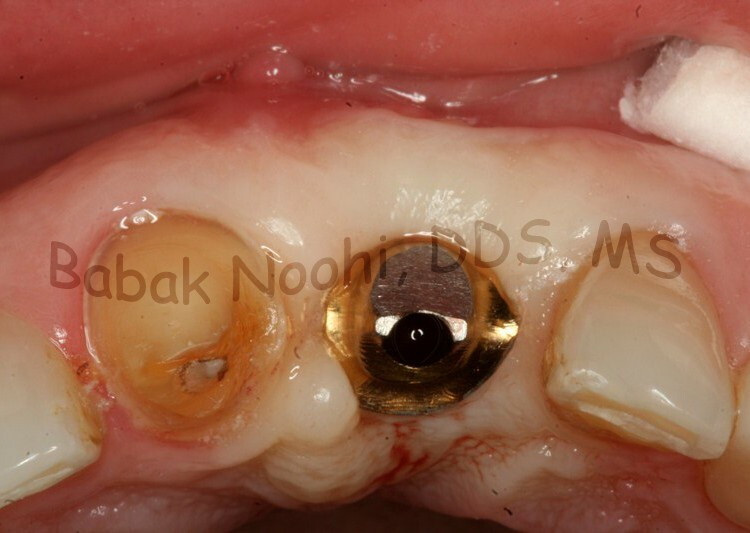 The “yellow” color of gold (instead of silver color of a cheaper material) will prevent the dark shadow under the gum (gingiva) and will make it look like a natural tooth. It is that meticulous attention to details that will bring a predictable outcome in our office. 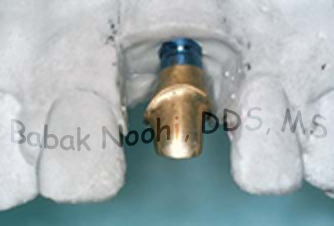 Custom Abutmnt is not a modified (re-shaped) Stock (prefabricated) abutment. The way it is made is that, a digital image is designed and then it is milling machine is used to mill the digital image from a cylindrical block of ally ( usually titanium, or Zirconium). 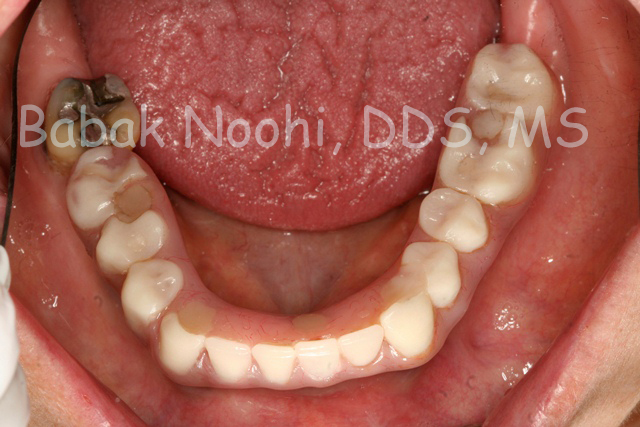 This patient lost her lower front teeth due to a fairly large infection. 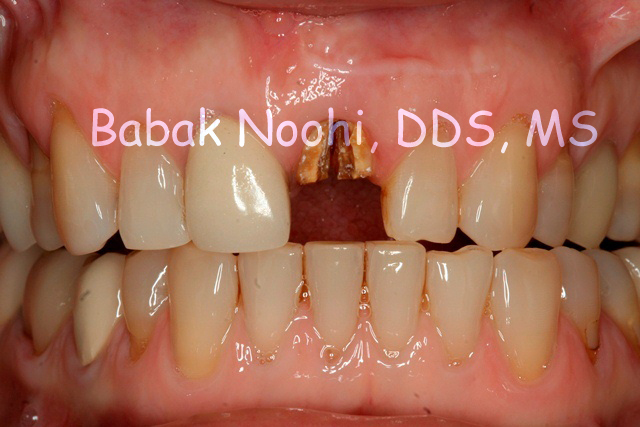 The initial phase of treatment consists of eradicating the infection and extraction of the middle teeth and regenerating the large bony defect. 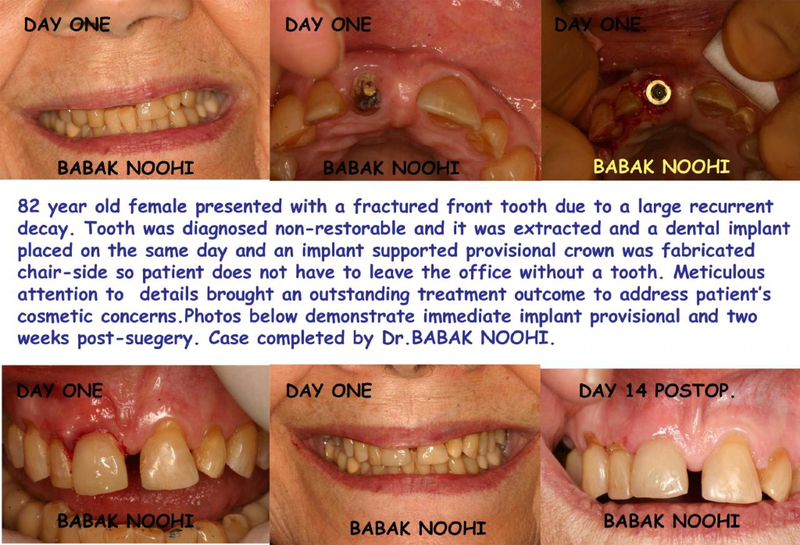 After several months of healing, two dental implants were inserted in the jaw bone and patient was given a provisional bridge as an interim restoration. 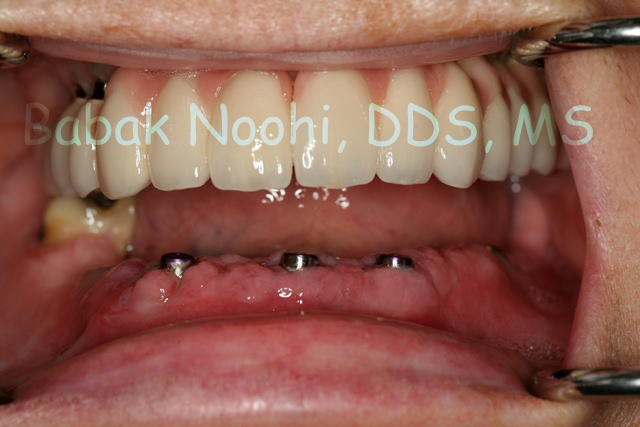 After a healing period, a four unit implant supported bridge was fabricate to replace the four teeth. Pink porcelain was also used to match the shade of the gum to idealize the look. 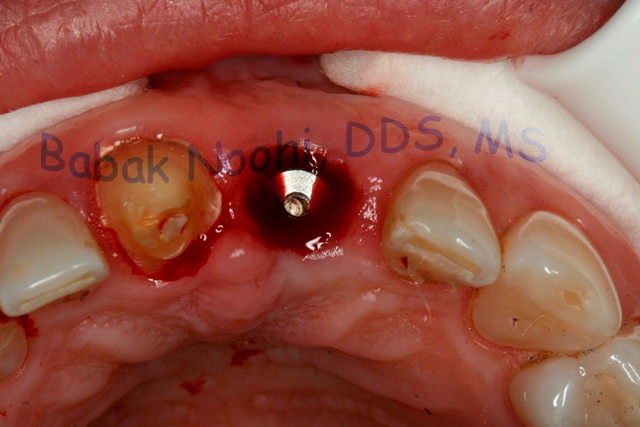 This case demonstrates there is no need to replace each missing tooth with a dental implant. Dental Implants is not just about drilling into the bone and inserting an implant. No surgical implant placement should be started unless there is a definitive restorative plan, which is standard care in our office. Esthetics is a defining element in success of a dental implant and long term success cannot be achieved without in-depth knowledge about biology to achieve those aesthetic results. 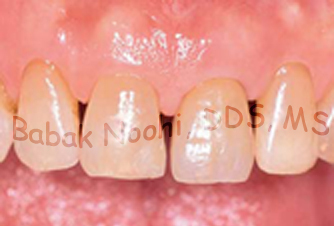 Provisional bridge and crown lengthening on the canines to idealize the gum level. 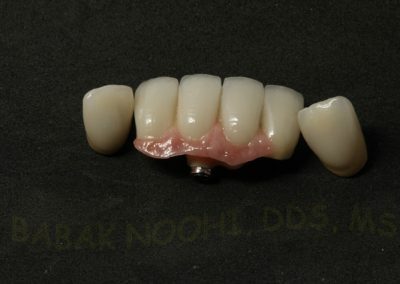 Implant supproted bridge with Pink Porcelain to mimic the gum. New and more attractive smile. 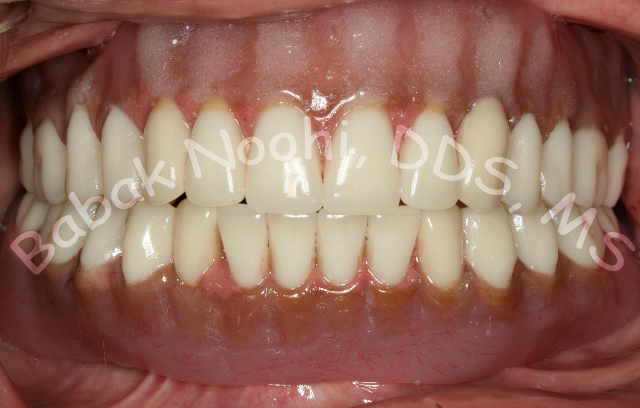 This female patient was referred to me for consultation regarding her loose lower front teeth. 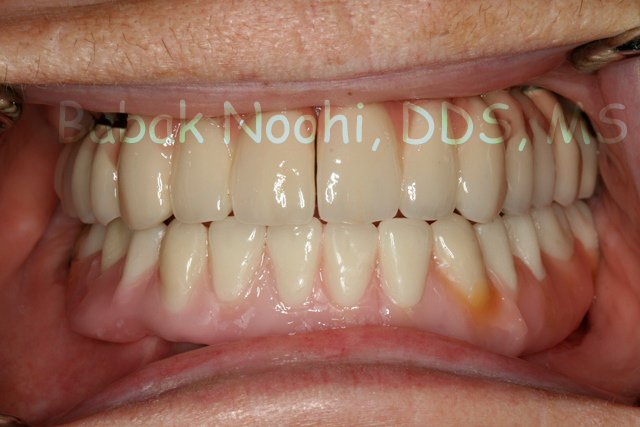 The patient had a history of gum disease and had lost many of her teeth in the past. Her upper jaw was subsequently restored with multiple implants and porcelain teeth. She was rather unhappy with her partial denture in the lower arch. 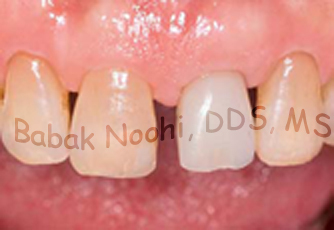 She was afraid that if she lost the front teeth, she wouldn’t be able to tolerate the partial at all. Her main concern was to have a type of prosthesis that she did not have to remove from her mouth every day. She was extremely shy and sensitive about being seen without her partial denture, even at home by her family members. She also told me, if she was going to have dental implants when she gets older, she might as well enjoy them while she is middle age and can take care of herself better. I offered her to replace her front teeth with six dental implants. 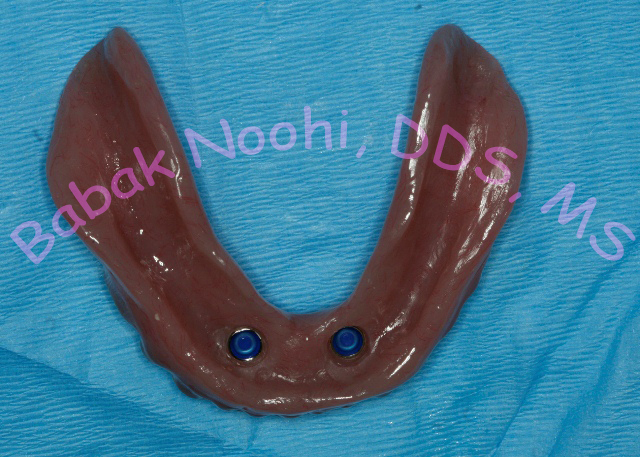 An implant supported hybrid prosthesis was made to connect to six implants in the front of the jaw. A hybrid prosthesis is connected to dental implants by screws and can only be removed by a dentist. 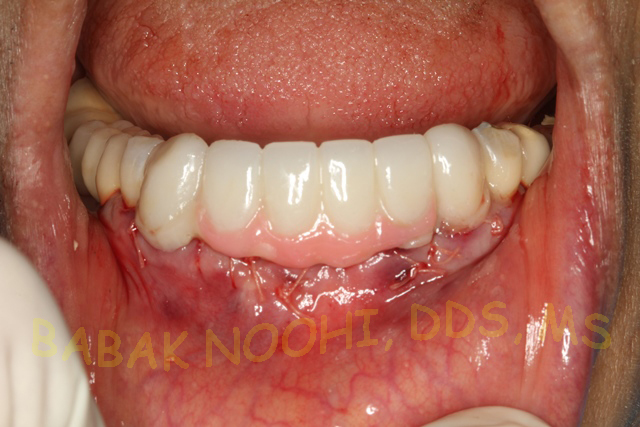 Patient was very happy with the outcome and following her up for 5 years, she only had one minor complication in the first year. The complication was when a tooth separated from the prosthesis and it had to be repaired. it was done chair-side and never happened again for 4 years when I was in contact with her. several teeth missing in the lower jaw and the remaining teeth are loose. 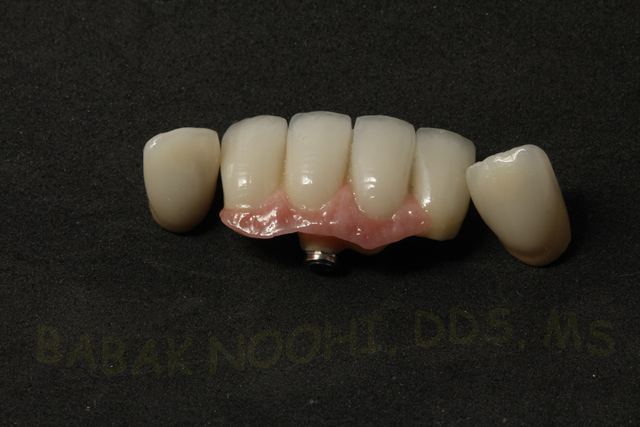 Patients Partial Denture. She is tiered of wearing it. 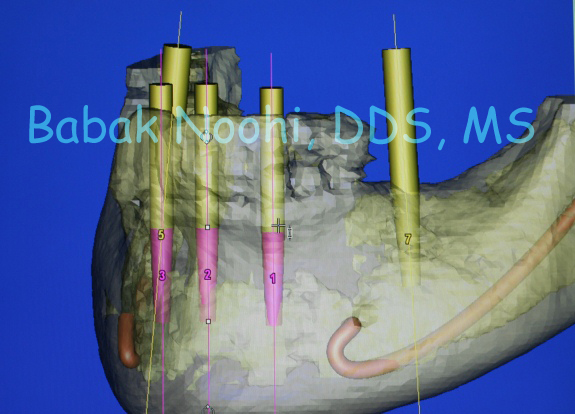 Virtual digital surgical planning prior to implant placement. new prosthesis in place, screwed onto the implants. 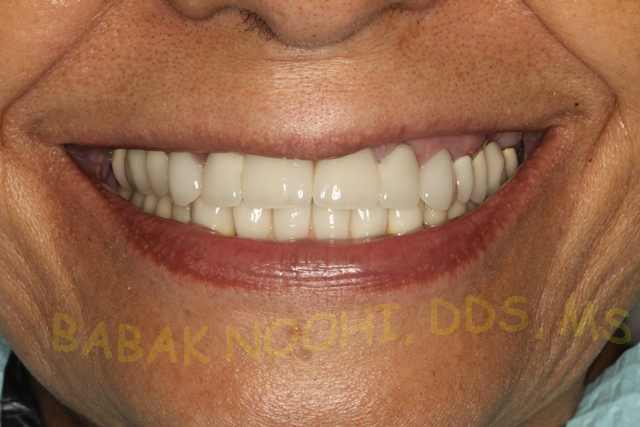 This patient was referred to me for fabrication of a new set of dentures. Her existing dentures were not ideal and her complaint was that it was moving too much. Her general dentist had relined it several times but it was not better. 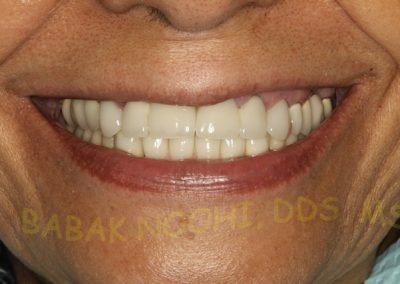 Finally she decided to fina a specialist who can help her and that was why she came to a Prosthodontist. As the first step, her dentures were re-based to provide adequate stability and improve the quality of her life temporarily, Then she was recommended to get two implants in the lower jaw along with a new set of complete dentures ( One new Denture for the upper jaw and one new over-Denture for the lower jaw). 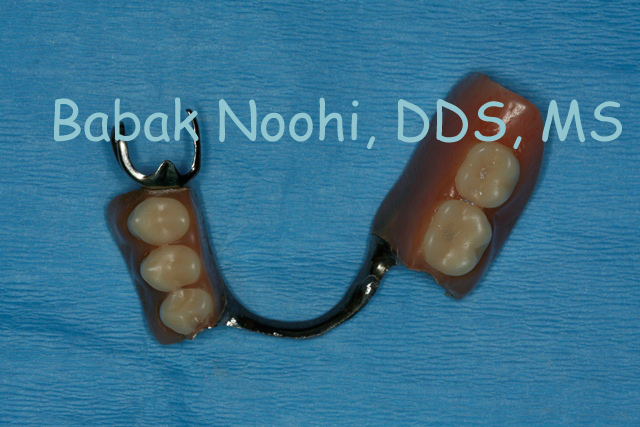 In this case she received two Nobel Biocare dental implants and two attachments to retain the denture. The improvement was like “the difference between day and night”, as the patient stated. 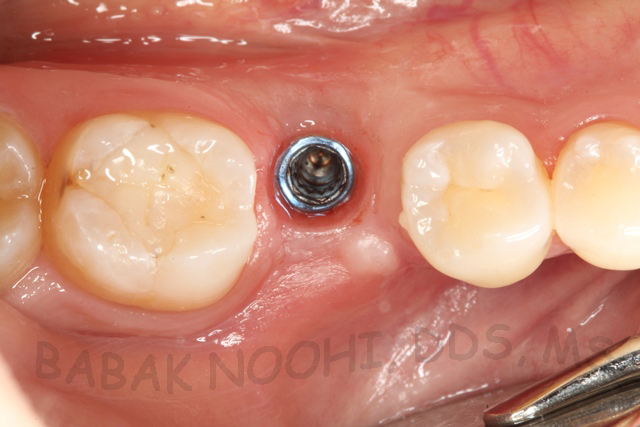 Extraction and Immediate Implant Placement. The State of the Art in Implantology. 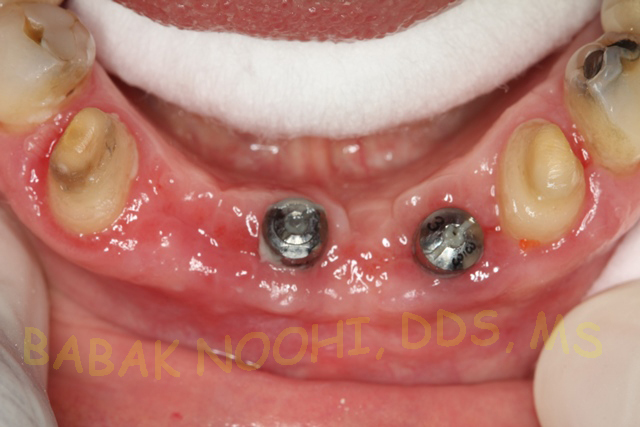 Immediate Implant placement right after extraction has its own challenges. 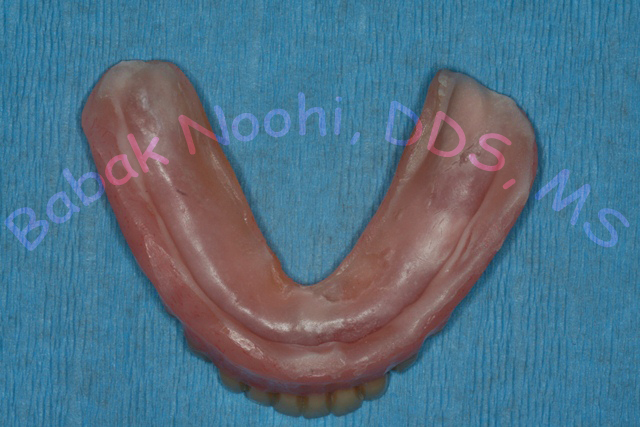 It required knowledge, skills and patients cooperation on the one hand and adequate jaw bone on the other hand. Replacing the missing tooth after extraction, can be achieved by different methods, one of which is fabrication of a fake tooth and bonding it to the adjacent teeth. Another option is to use a Flipper or a Partial Denture (a removable appliance) and wear it as an interim replacement. A third option is to wear an invisalign tray where the missing tooth is filled in with tooth colored material that replaces the missing tooth, the drawback is that you cannot ear with it and you need to take it out. 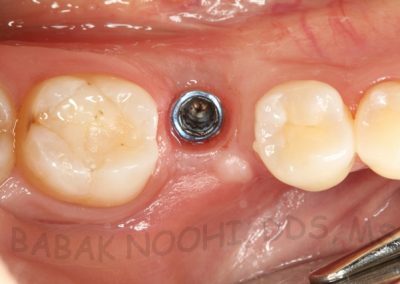 The most advanced and most difficult option is to fabricate a Provisional Crown and connect it directly to the implant itself right at the time of implant placement. 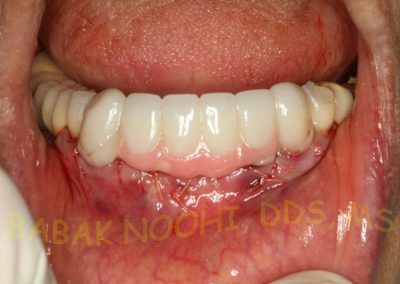 This option is mainly used for the front teeth and patient should not eat on that side while it is healing. 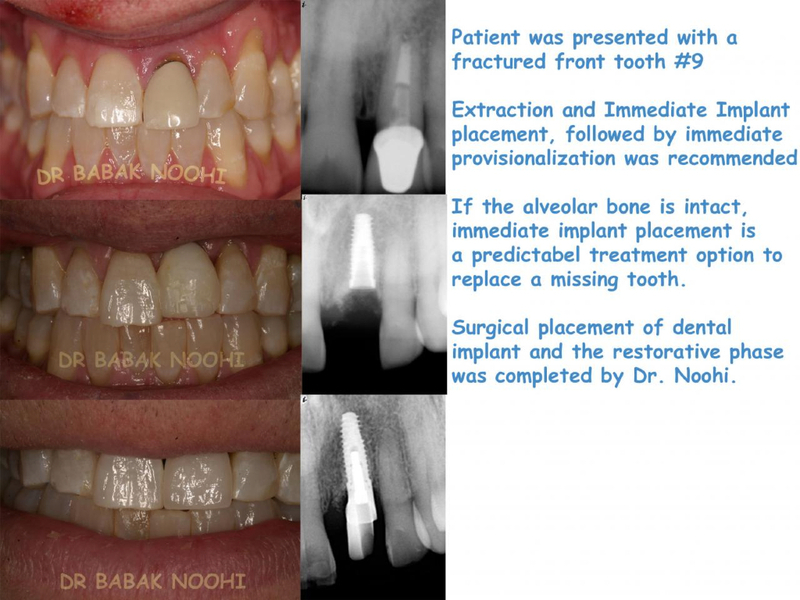 Extraction #9 due to Fracture and Immediate Implant Placement. 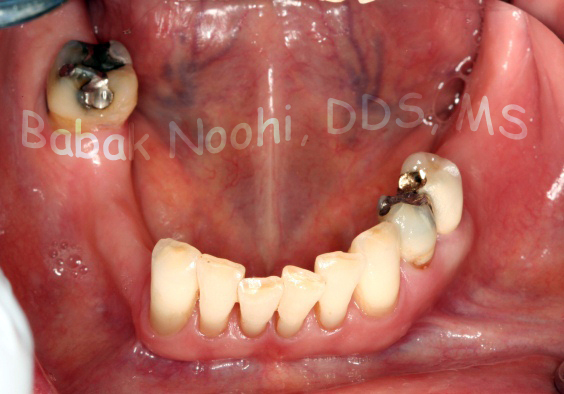 This case presents extraction of #9 and Immediate Implant placement. However, due to anatomical reasons immediate Implant loading with a Provisional Crown was not possible, or was too high of a risk for failure, and i chose to use a Maryland Bridge to replace the missing tooth while the implant was healing. Replacement of a Fractured Front tooth #8, Extraction, followed by same day dental implant placement and Immeidate Provisional Implant supported Crown. 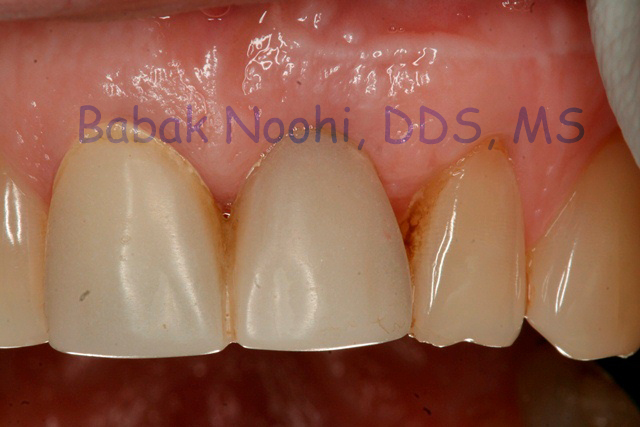 82 year old female presented with a fractured front tooth due to a large recurrent decay. Her main concern was that she did not want to be without a front tooth and did not want to wear a partial denture at all. 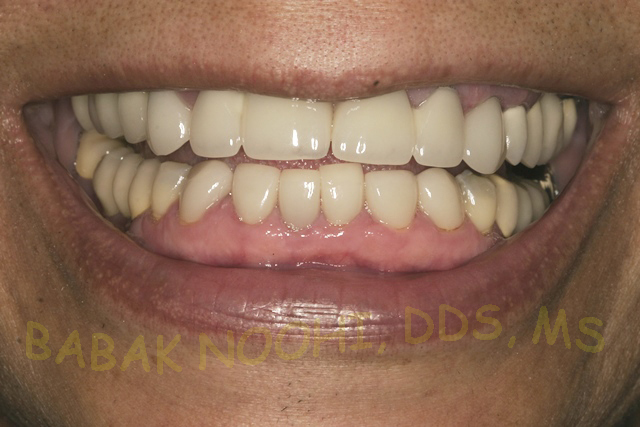 Tooth was diagnosed non-restorable and it was extracted and a dental implant placed on the same day and an implant supported provisional crown was fabricated chair-side so patient does not have to leave the office without a tooth. Meticulous attention to details brought an outstanding treatment outcome to address patient’s cosmetic concerns. 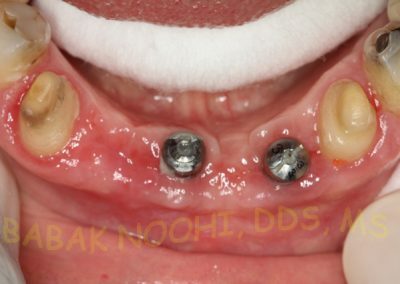 Photos below demonstrate immediate implant provisional and two weeks post-suegery. 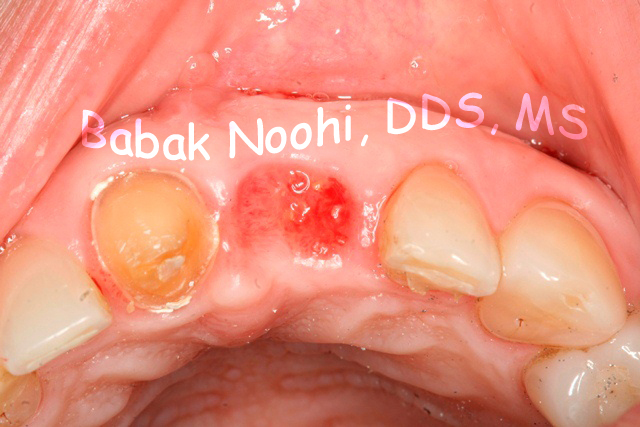 If you have a similar problem, feel free to discuss your conerns and ask Dr. Noohi, how he can help you. 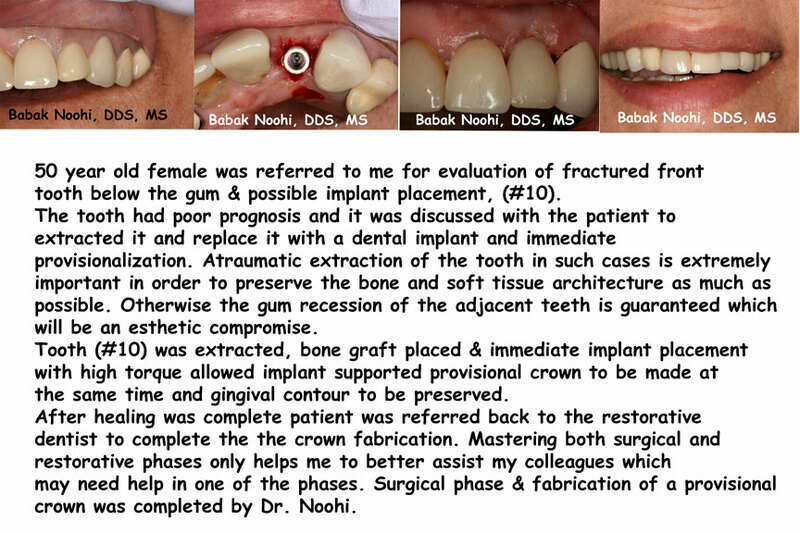 Surgical Implant placement and restorative work was completed by Dr.BABAK NOOHI. 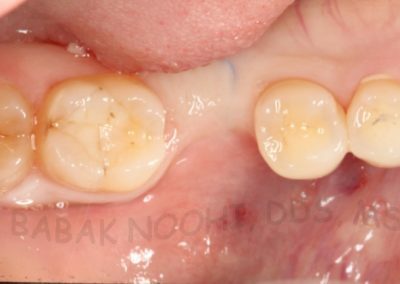 Extraction of #12 due to root fracture and Immediate Implant Placement followed by fabrication of an Implant supported Provisional Crown. 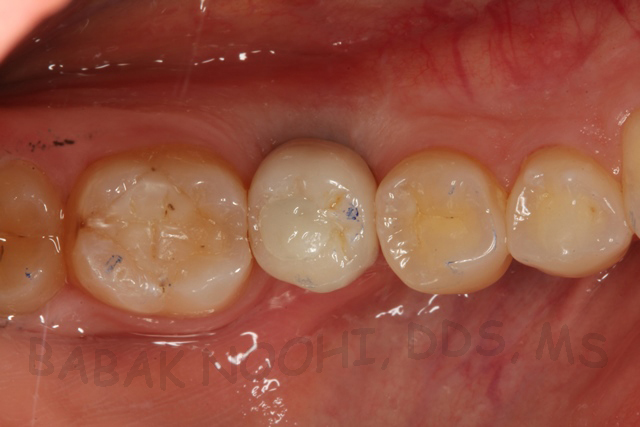 This case demostrates extraction of a root canal treated bicuspid due to root fracture. 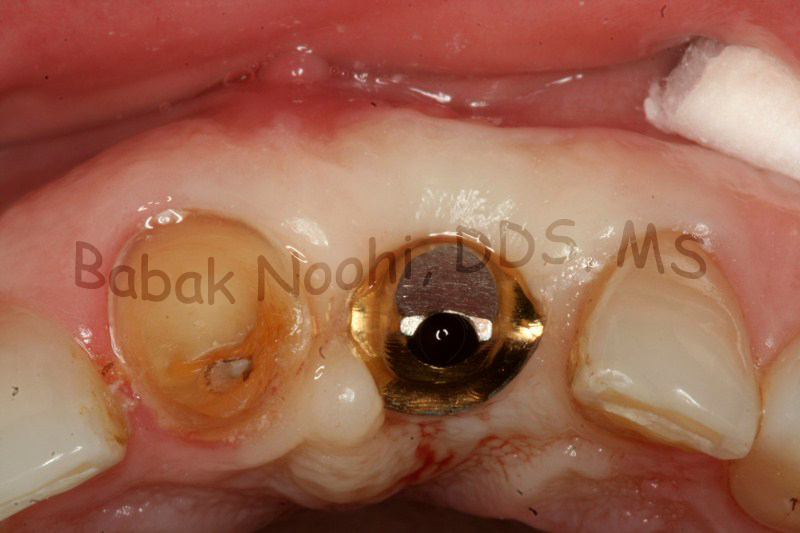 Extraction of #10 after root Fracture followed by Immediate Implant Supported Provisional Crown. 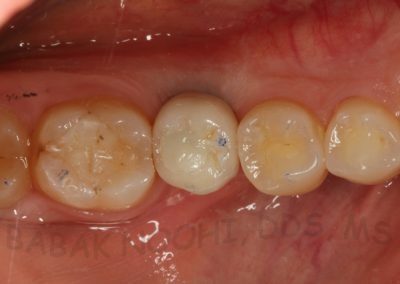 This case demostrates extraction of a failed root canal treated tooth #10 followed by immediate implant palcement and immedaite provisional crown attached to the implant. Wearing a flipper or a partial denture after tooth extraction is not uncommon. Infact many dentists choose a flipper or a partial, which is a removable appliance replacing the missing tooth. If theextraction site is favorable, an implant supported crown is a better treatment option. It is a more expensive one as well. 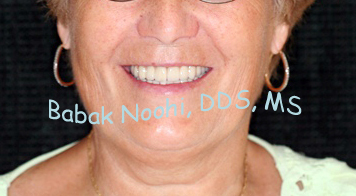 If you want to have the benefits of a state of the art treatment, Talk to Dr. Noohi, and further discuss what you need and explore the treatment option.